Paris is one of the most infamous mortals from Greek mythology; for Paris is blamed for bringing about the destruction of one of the most famous cities of the Ancient World. Paris of course came from Troy, and his abduction of Helen from Sparta is the reason why a thousand ships, all packed with heroes and men, arrived at the gates of Troy; and ultimately the city of Troy would fall to that force. Paris was more than just an inhabitant of Troy though for he was a prince of the city, the son of King Priam and his wife Hecabe (Hecuba). King Priam of Troy was well known for his many offspring, and some ancient sources would claim that he was father to 50 sons and 50 daughters, meaning that Paris had a lot of siblings, although amongst the most famous were Hector, Helenus and Cassandra. A myth appears in the stories of Ancient Greece about the birth of Paris, for when pregnant, Hecabe had a premonition of Troy being destroyed by a flaming torch or brand. This dream was interpreted by Hecabe’s stepson Aesacus, who was amongst the most famous seers of the ancient world; Aesacus would decipher the premonition as meaning that the unborn child of Priam would bring about the destruction of Troy. Aesacus would urge his father that the baby would have to be killed as soon as it was born. When the baby was born though, neither Priam nor Hecabe could bring themselves to kill their own son, and so a servant, Agelaus was charged with the task. This new-born son was of course Paris, who was also referred to as Alexander, just as sister Cassandra was also referred to as Alexandria. Agelaus was a shepherd who looked after the flocks of the king upon Mount Ida, and so Agelaus decided to simply expose the baby upon the foothills, killing him in this manner. After 5 days, Agelaus returned to the spot where he had left the son of King Priam, fully expecting to bury a body, but low and behold, Paris was still alive. Some ancient sources would claim that Paris had been suckled and kept alive by a she-bear. At that point Agelaus surmised that the boy had been kept alive by the gods, and so Agelaus decided to raise Paris as his own son, although King Priam was informed that their son was dead. Growing up upon Mount Ida, Paris proved to be able assistant to his “father” Agelaus, learning the skills of rural life, as well as keeping thieves and predator’s away from King Priam’s livestock. The son of Agelaus would be known as being handsome, intelligent and fair. 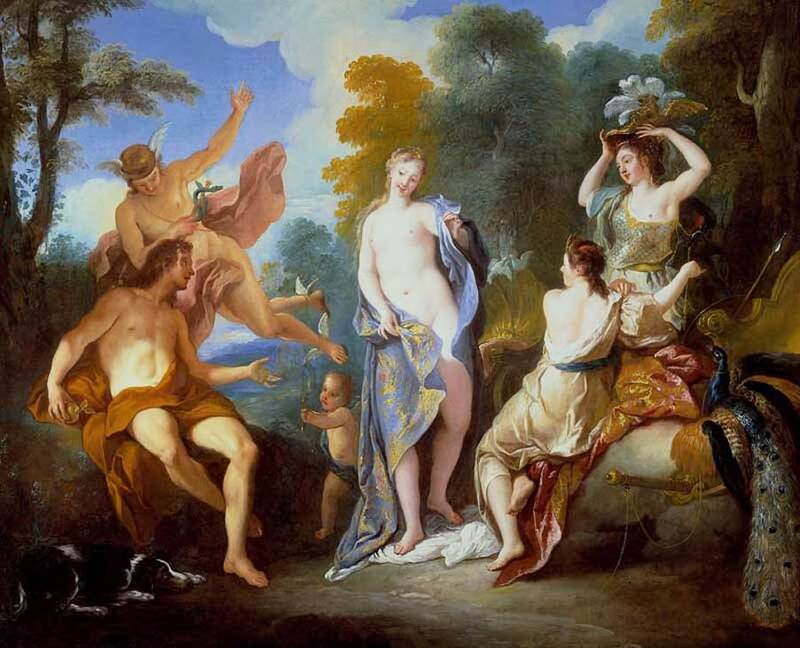 Even the gods and goddesses of Ancient Greece were taking note of Paris, and Oenone, the Naiad nymph daughter of Cebren fell in love with the shepherd. 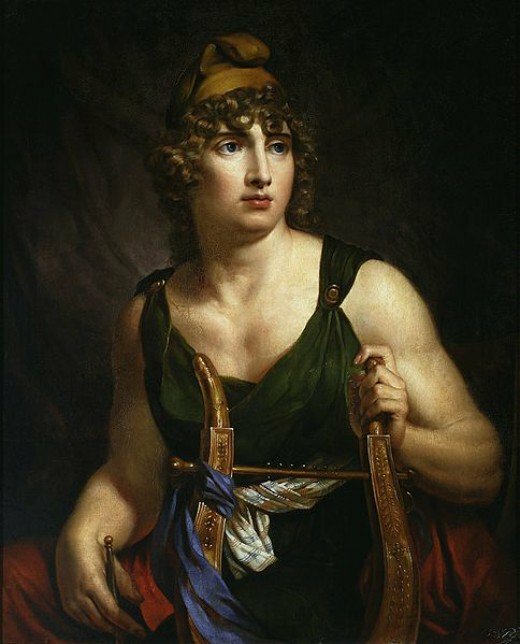 Oenone was highly skilled in the arts of prophecy and healing, and the nymph of Mount Ida, was fully aware of who Paris really was, although she did reveal it. 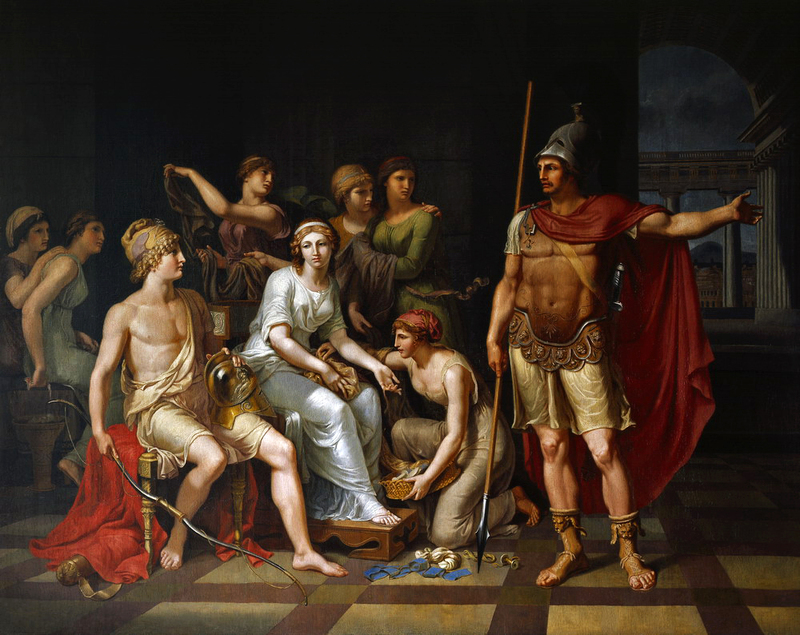 Oenone and Paris would wed, but from the very outset Oenone would warn Paris of the dangers of leaving the Troad, and pleaded with her husband never to travel to Sparta. At some point Paris find out who his true father was, and King Priam would find out that his presumed dead son was still alive. How this reconciliation occurred is not expanded upon in the surviving ancient sources, but there is a suggestion that recognition occurred when Paris competed at one of the Games held at Troy. As previously mentioned Paris had gained a reputation for fairness, and this was exhibited when Paris acted as judge to decide the best bull at the local cattle show. The final decision came down to two bulls, one which just happened to belong to Paris, and a second bull of unknown origin. Paris though awarded the strange bull as the best at the show, basing his decision upon the merits of the two beasts, and this second bull was in fact the Greek god Ares in disguise. The impartiality of Paris was thus recognised amongst all of the major Greek deities. This impartiality was subsequently the reason why Zeus decided to make use of the Trojan youth to decide another contest. This though was not a contest about the best cattle, but rather about which goddess was the most beautiful. A contest had been called when Eris, the Greek goddess of Discord, had thrown a Golden Apple amongst the assembled guests at the wedding of Peleus and Thetis. Eris was angry at not being invited to the wedding feast, and so on the apple had been inscribed the words “for the fairest”, knowing that this would cause an argument amongst the assembled goddesses. Three powerful goddesses each claimed the Golden Apple, believing they were the most beautiful, and these three goddesses were of course Hera, Athena and Aphrodite. Zeus himself was too wise to make any judgement himself, and so Zeus dispatched Hermes to bring back Paris to make the difficult decision; the Judgement of Paris. Now, certainly Hera, Athena and Aphrodite were extremely beautiful, but none was willing to allow looks alone to decide the contest, and so, despite the reputation of Paris for impartiality, each goddess decided to try and bribe the judge. Hera would offer Paris dominion over all the mortal kingdoms, Athena would promise Paris all known knowledge and warrior skills, whilst Aphrodite offered Paris the hand of the most beautiful of all mortal women. Now of course it cannot be said that these bribes affected the decision of Paris, but when the Trojan prince named Aphrodite as the most beautiful of the three goddesses, he took up the option of the goddess’ bribe. The most beautiful of all mortal women was Helen, the daughter of Zeus and Leda, but of course Helen was already married to King Menelaus of Sparta. This though did not stop Aphrodite or Paris, and soon Paris had abandoned Oenone upon Mount Ida, and was heading to Sparta, despite the previous warning of his wife. Paris was initially a welcome guest at Sparta, but King Menelaus had to depart for the funeral of King Catreus of Crete. Paris took his chance and soon the Trojan prince was on his way back to Troy, with Helen in tow and a sizeable amount of Spartan treasure in the bowels of his ship. 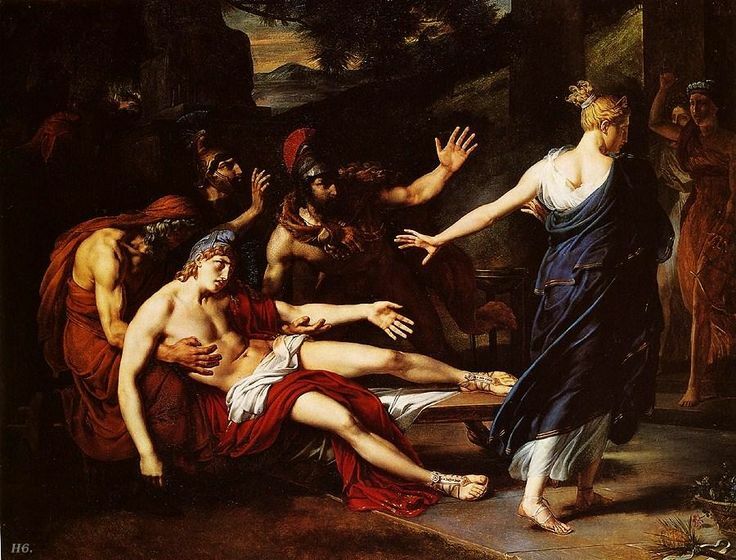 Some say it was a true abduction of Helen, and some say that Aphrodite had made Helen fall in love with Paris, but in either case, the actions of Paris would see the Oath of Tyndareus invoked, and heroes from across Greece were fathered to aide Menelaus in the retrieval of his wife. When Paris returned to Troy, with Helen and the Spartan treasure, the only one to chastise him for his actions was Hector, Paris’ brother. Hector was heir to the throne and hero of most renowned amongst all Trojans; Hector recognised that the actions of his brother would mean war. War itself was not yet inevitable, for even after the arrival of the Achaean forces, there was a chance to avoid bloodshed, for the agents of Agamemnon, simply asked for the return of what was stolen. Paris was willing to give up the treasure, but was adamant that Helen was not leaving his side. Thus war commenced. It might be assumed that as a son of Priam, and also the person to cause the war, that Paris would be a prominent defender of Troy. In reality though, his exploits were overshadowed by that of Hector and Aeneas, and even the likes of Deiphobus were portrayed as being more heroic than Paris; in fact, Paris was not particularly well thought of by the Trojans or the Achaeans. Part of this perception came about because Paris’ fighting skill lay in the use of bow and arrow, rather than in hand to hand combat; although conversely, Philoctetes and Teucer on the Greek side were both highly regarded. At one point during the Trojan War, Hector though managed to convince Paris to fight against Menelaus to decide the war. 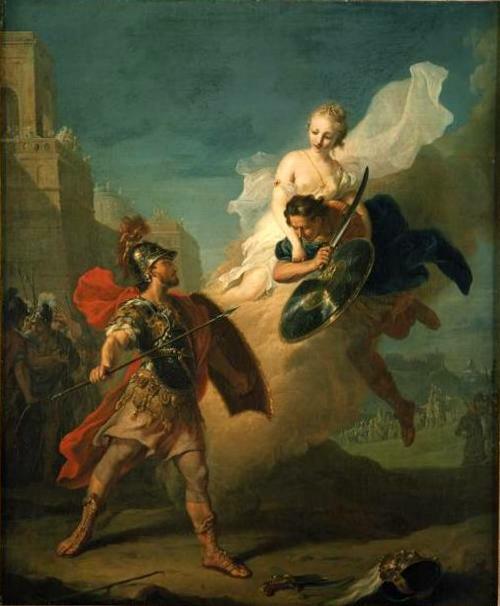 Despite the fact that Menelaus was not the greatest fighter in the Greek force he easily defeated Paris in close combat, but before a killing blow could be delivered by the King of Sparta, the goddess Aphrodite rescued Paris from the battlefield. Paris during the war was named as killing two Greek heroes, although Hector was said to have killed 30. The first Greek hero killed by Paris was Menethius, the son of Areithous and Phylomedusa,with an arrow. An arrow also allowed Paris to wound Diomedes, before Paris shot Euchenor, the son of Polyeidos and Eurydameia, through the jaw killing him. A third hero, Deïochus, was killed by Paris with a spear though. The fourth victim of Paris though is the most famous, for that hero was the greatest of those to fight upon the Achaean side, Achilles. Today, it is normally stated that Paris killed Achilles by shooting him in the heel, although in the ancient sources simply said Achilles was killed by an arrow to an unprotected part of his body. The same ancient sources would also state that Paris was aided in the kill by Apollo, with the god guiding the arrow to its mark. A less common version of the death of Achilles, sees the Greek hero killed in an ambush that occurred in the temple of Achilles, the Greek hero having been fooled into coming alone to the temple, believing he was to meet Polyxena, the daughter of King Priam. The death of Achilles did not end the Trojan War though, for a hoard of Greek heroes still lived; Paris though would himself not survive the Trojan War. Philoctetes was now amongst the Greek forces, and he was an archer even more skilled than Paris, and Philoctetes was also the owner of the bow and arrows of Heracles. An arrow unleashed by Philoctetes would hit Paris, although the hit itself was not a killing blow, the arrows of Philoctetes though were coated in the blood of the Lernaean Hydra, and it was the poisonous blood that started to kill Paris. Now either Paris, or Helen, asked Oenone to save her former husband from the poison, something that might have been in her power to do. Oenone though refused to do so, having been abandoned previously by Paris. 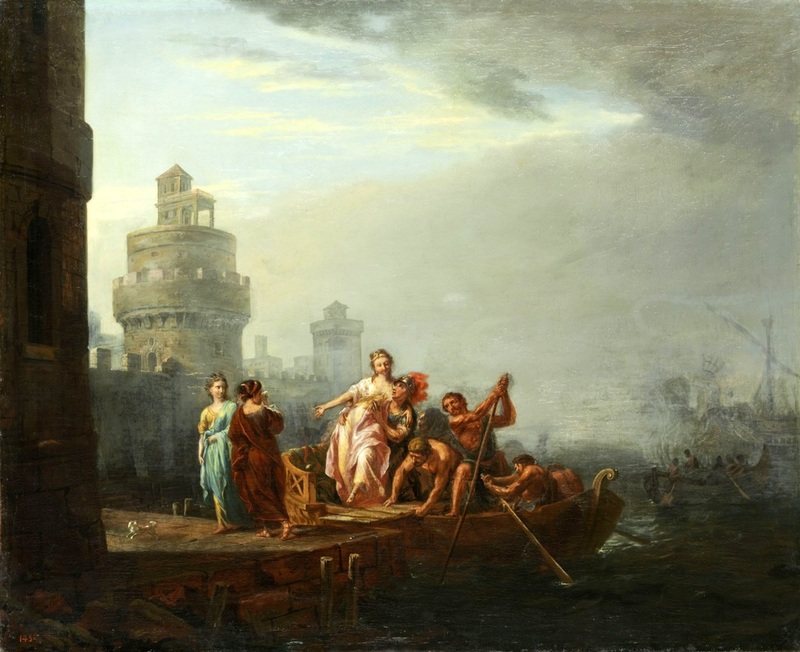 Thus Paris would die in the city of Troy itself, but as Paris’ funeral pyre was lit, Oenone herself would throw herself on it, committing suicide as the body of her former husband burnt. Some sources claimed this was due to the love that Oenone still harboured for Paris, whilst others claimed it was remorse for not having saved him. The death of Paris came before the Wooden Horse ruse saw the Achaeans within the walls of Troy, and whilst ultimately Paris was the cause of the destruction of Troy, just as the premonition of Hecabe had shown, the Trojan Prince would not witness the destruction of his home.